Published in print in 1956, If I Ran The Circus, is similar to the Dr. Seuss classic, If I Ran the Zoo. In this title, a boy named Morris McGurk lets his imagination literally run wild, picturing a grand circus in an empty lot. From fanciful acts like a walrus that cam stand on one whisker to a herd of "Through-Horns-Jumping-Deer", McGurk's plans grow more and more elaborate. If I Ran the Circus also has top-notch features from Oceanhouse Media in app form. Enhancements are primarily educational and focused on word recognition, although lots of interesting sound effects are also connect the images with word meanings for young listeners. Great narration with highlighting word-by-word reinforces the text and if a child taps on any word, they can hear it spoken again. If you tap on an image in the illustrations, the word will appear with accompanying audio. And as a bonus, if that image is present in the text of the story, the word will highlight again, too. 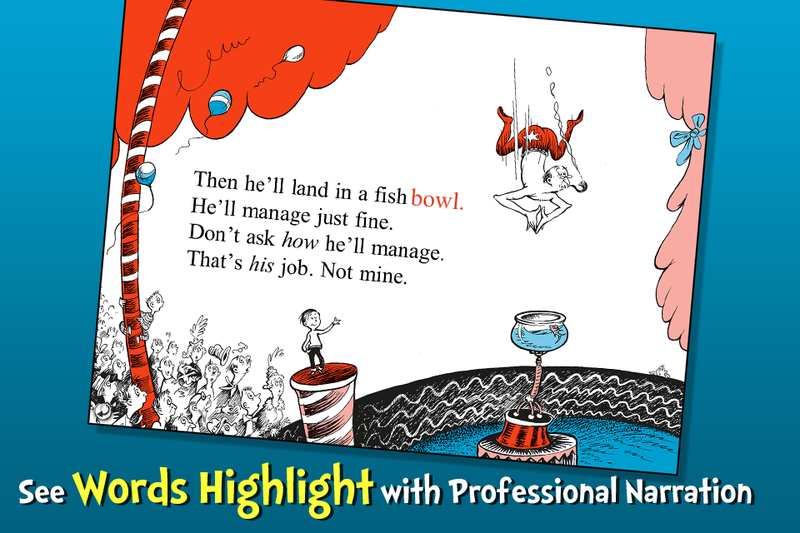 Overall, whimsical storytelling, told in rhyme, make this classic Seuss tale appealing decades later, along with great digital enhancements perfect for a modern audience. The message within the story is subtle but also makes for good converstations or extension activities in a classroom setting. In print and digital Seuss is tops with young and old alike, precisely because his books make learning to read fun. Recommended! Behind Mr. Sneelock's ramshackle store, there's an empty lot. Little Morris McGurk is convinced that if he could just clear out the rusty cans, the dead tree, and the old cars, nothing would prevent him from using the lot for the amazing, world-beating, Circus McGurkus. The more elaborate Morris' dreams about the circus become, the more they depend on the sleepy-looking and innocent Sneelock, who stands outside his ramshackle store sucking on a pipe, oblivious to the fate that awaits him in the depths of Morris's imagination. The Sneelock doesn't yet know that he'll have to dispense 500 gallons of lemonade, be lassoed by a Wily Walloo, wrestle a Grizzly-Ghastly, and ski down a slope dotted with giant cacti. But if his performance is up to McGurkian expectations, then "Why, ladies and gentlemen, youngsters and oldsters, your heads will quite likely spin right off your shouldsters!"